I'm somewhat confused with your comment. There're 2 parts...the first one tells me that you are skeptical about Nokia and the second tells me you are confident... Which one am i supposed to believe?? I can't decide which thumb to give you...haha...that's a joke. All is well that satisfies the customers... Hope more updates come soon with major improvements. don't expect much from a person who puts an "i" before a word and uses it as an screen name. Saw that, yes, but decided to ignore it...same as i ignored his first part and gave him a thumb up. "People get confused with too many decimal places." Direct quote from Damian Dinning when I asked him about this. So, why didnt the camera come out perfect before they released it? The iPhones don't come out perfect. They get reboots (3Gs, 4s, 5s) after a while. The Samsung GS3, read about the phone conks out after a few months? That's what updates are for, man. yeah nexus 4 also subject to the purple crap...so what else you got? 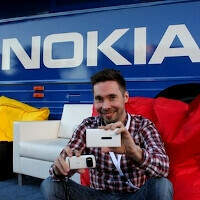 i might not get lumia 920, will wait for something more monstrous that can be comparable to the god of camera phone 808!!! but i'm so getting 808 pureview! !